One of an Amazon’s sellers most important jobs is to discover the words that buyers are using to search for their product. Why? Because they need to make sure that all of the most important terms are included in their Amazon listing. They also need to make sure that their PPC campaigns use relevant terms, with good traffic and sensible competition. Otherwise, they are losing out on potential sales, and wasting money. So how can sellers find keywords? One way, is to get a thesaurus and sit racking your brains for all the terms that someone could possibly use to find your product. This is going to be a painful experience. You’re almost certainly going to miss words out, and have no useful data on the ones you do find. Luckily, there is a whole category of software focused on generating keyword suggestions and providing data on their popularity, relevance and competition. I’ve reviewed four of those tools, to help you choose the right ones. They range from under $10 per month, right through to nearly $400 and there’s also one with a “free forever” plan. The type of data they produce varies, as does the complexity of their interface, with some having Chrome extensions and others just web apps. Why do sellers use keyword tools? There are two primary reasons why Amazon sellers use keyword tools. The first, is when they’re optimizing their listings, and want to include the most relevant, high-volume keywords in their title, bullets or description. They may also want to optimize their back-end keywords. By making sure that you’re including all of the main keywords that buyers might use when searching for your product, you should rank for more terms, and see increased traffic to your listings. If your listings convert well, this will translate into more sales. The second important reason to use these tools, is when you are optimizing your Amazon PPC campaigns. By using a keyword tool, you might discover new keywords that you hadn’t thought of, with high traffic but a low cost-per-click. It may also be that you’re just setting up your Amazon PPC ads and are looking for terms to start with. By using a keyword suggestion tool, you can make more informed decisions and help ensure you don’t start on the wrong foot, or get any nasty surprises – such as expensive keywords that don’t convert to sales. Not only can you use the estimated search volume scores to weed out low-volume terms, but most keyword tools will also give you an estimate of a keyword’s cost-per-click. I’m now going to walk you through four Amazon keyword tools. To be included, they need to have a keyword-driven search feature. The keyword suggestions that they generate must be accompanied by data, giving some indication of search volume and competition. They may include other useful data such as CPC bid estimates. Sonar is a useful free keyword research tool which hasn’t been included in this post, as it doesn’t include keyword volume data. You can see a walkthrough of Sonar in our post on the best free Amazon product research tools. We’ve also included all four of the tools covered in this article, in our video walkthrough. First up, is Helium 10 and its keyword generator tool, Magnet. Getting started is pretty simple, you just click the magnet icon on the left, enter your seed keyword, select which of Amazon’s marketplaces you want data on and press search. The next screen will ask you to select a product category. You have a few options here. You can choose to search all departments, one of Amazon’s high-level categories, or a subcategory. If you have a good idea of which category your product belongs in, then use a high-level category, as it gives you a sensible volume of relevant keywords. So, for my golf balls, I would choose “Sports & Outdoors”. Based on this information, Magnet produces some initial keyword suggestions, and asks you to select the terms that are relevant to your product. When you’ve done this and clicked research, the keywords that you selected become additional seed keywords, and are used to help generate even more relevant terms. The final results page can take several minutes to load. If you don’t want to wait that long, that’s fine. You can simply come back later and find the results in the history tab. Whether you decide to wait or access them through the history tab, the results page looks the same. At the top, is an overview of the results, showing data like the number of phrases found, the length of the phrases and the total number of unique keywords. There is also a clever donut chart, that shows how many new terms were generated from each seed keyword that you entered or selected. If we then delve into the search results, you’ll see that each keyword has a rating. This is calculated by Helium 10’s algorithm and is a baseline figure for how relevant that term is to your original keyword. It’s best to use this figure as a guide, and consider it in context with your product, as it could be a better fit than the algorithm realizes. Next to this, you have two search volume estimates, one for how many monthly searches each term gets as an exact phrase, and one for how many monthly searches each term gets as a broad phrase. It’s probably best to order the results by either of these columns, and then use the data to find high volume keywords that you feel are relevant to your product. In terms of filtering the results, you can use the search bar just above the results to find phrases that contain specific words, exclude specific words, or you can filter by search volume. You can also use Magnet in conjunction with Helium 10’s other tools. For example, you can export the results to Frankenstein and format them ready for copying into Amazon. It is also worth mentioning Helium 10’s Cerebro tool, which shows you all the keywords that products on Amazon are ranking. It’s really easy to use too! First, you go over to Amazon and copy your competitor’s ASIN. Then you fire up Helium 10 and click on the brain icon, over on the left, to bring up Cerebro. Paste in that ASIN, select your marketplace and you’ll soon see a long list of all the keywords that have ever returned that product in an Amazon search. Now, because it’s quite extensive, you do get some random keywords, but you also get lots of relevant ones. For each keyword, you get a good set of data. First, you get a Cerebro IQ Score, which shows the ratio between search volume and competition. A high score here indicates a good ratio of low competition to high search volume. Then, you have estimates for how many searches the keyword gets as an exact phrase and a broad phrase. The next two fields give you data on the number of ASINs that had Sponsored ads or Headline Search ads when this phrase was searched for. After this, you can see the number of products that rank for each keyword. In the final two columns, you have the CPR (Cerebro Product Rank) scores. The “CPR Total Giveaways” field gives you an estimate of how many units you would need to sell, over an eight day period, to rank on page one for that keyword. The “CPR Daily Giveaways” field divides this figure by eight, to tell you how many units you need to sell a day, over that eight day period. So, if my Total Giveaways score was 800 units, my Daily Giveaways score would be 100 units. Helium 10 offers four different pricing plans, ranging from a free forever plan to $297 per month. The free plan is very limited, and doesn’t offer any access to Magnet. To get access to Magnet, you would need the Gold Plus Plan, which is $97 per month. This offers sellers 25 uses per month of Magnet, as well as 10 daily uses of Cerebro. The second tool that we are going to look at is Scope, an Amazon keyword and product research tool developed by Seller Labs. Scope has two parts to it, a web app which features the keyword generator, and a Chrome extension, that extracts your competitor’s keywords. We are going to look at the web app first, where getting keyword suggestions couldn’t be easier. You simply click the “Keyword Generator” tab and, when prompted, enter your seed keyword. 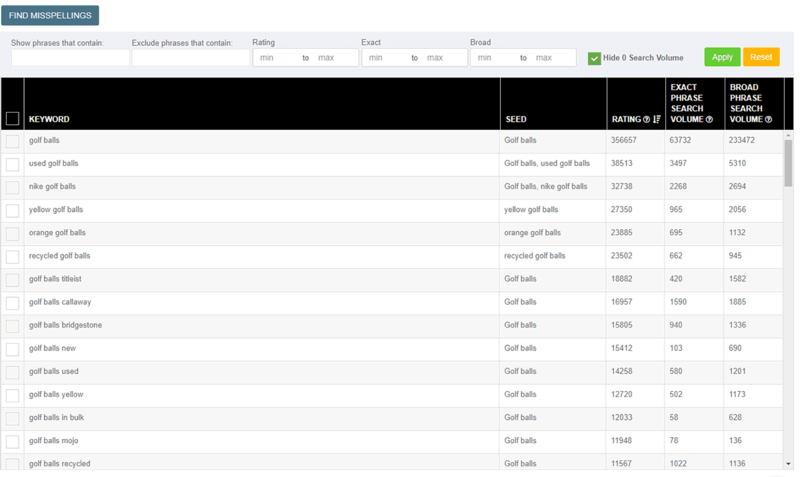 Within seconds, Scope generates a list of 100 related keywords, with useful data displayed for each term. You can see in the picture above, that for each keyword suggestion, you get a relevancy score. This gives you an indication of how closely related the term is to your original seed keyword. In the next column, you have a score for how strong each keyword is, based on sales rank and search volume. The higher the score, the stronger the keyword, but remember that while a keyword with a score of 95 may be strong, it’s likely to be very competitive. The last three columns are a bit more self-explanatory. First you have search volume, which is an estimate for the number of impressions each keyword has got this month. You also have an estimated cost-per-click bid and the number of products that are currently ranking for that keyword on Amazon. When it comes to taking action on this data, you have a few options. You can click on the binoculars to watch a keyword and add it to your tracklist, you can download the data as a CSV file, or click the Amazon icon to search Amazon.com for that keyword. After you’ve generated this list of keywords, you may want to use some of them as seed keywords, and run further searches. Scope make this easy for you, as by clicking on the cog icon, over on the right, it automatically runs a keyword search for that term. 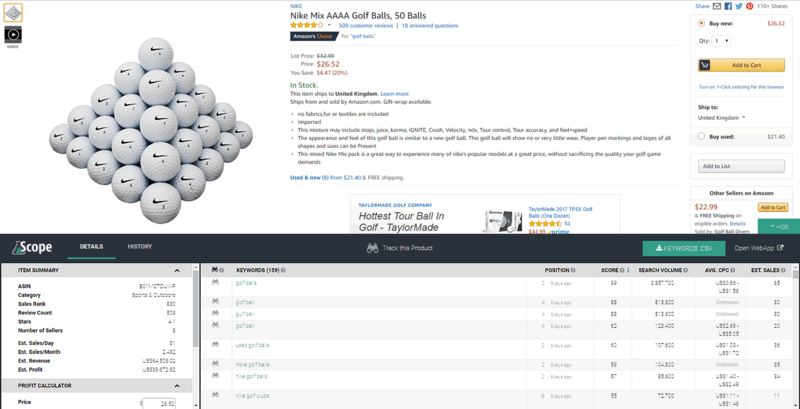 So, if I clicked that icon for the term “callaway golf balls” it would run a new search, with that as my seed keyword. As I mentioned before, this isn’t the only way to produce keyword suggestions using Scope, you can also generate them by using the Chrome extension. This works differently to the keyword generator and works directly on Amazon product pages. So, after you’ve downloaded the extension from the Chrome Store, go to Amazon.com and search for one of your keywords. Now Scope does produce rich data on the search results page, but because we are only covering keyword functions, we will ignore that for now. Instead, select a product, and go through to the product detail page. In the bottom right corner of the screen, there should be an icon saying “Show Scope”, click on this. Scope will then appear, and start generating all the keywords that the product is ranking for. Each keyword is accompanied by five different pieces of data. The first is the position that the product ranks when each keyword is searched for on Amazon. This information goes out of date quickly, as product ranking changes all the time, but by tracking a keyword, the data is updated every 24 hours. The next column is the score for how strong each keyword is, which works the same way as in the web app. You also still have the estimated number of impressions that the keyword has had over the last month and an average cost-per-click bid for Amazon PPC campaigns. The final column is an estimate of how many monthly sales the product gets from each keyword. This is based on a product’s sales rank within its main category, and like all estimates, should be used in tandem with more solid data. The sales estimates are only available if you are on a paid Scope plan. Scope has three different pricing plans. Use of the Scope extension is free but to use the Web App you need either the “Essentials” plan ($390 per year) which allows you to track 100 keywords and products, or the “Startup” plan ($690 per year) where you can track 400. It is also worth noting that Scope is only available for Amazon.com. Now we’re going to look at AMZDataStudio, who offer a number of keyword, SEO and PPC research and optimization tools. Unlike the other Amazon keyword tools, AMZDataStudio is best known for its keyword extraction tool, so that’s where we will start. As ever with keyword extraction tools, the first step is to go to Amazon and copy the ASIN that you want to generate keyword suggestions for. When you’ve done this, open up AMZDataStudio and choose the “Competitors’ Keywords Finder” tool. Next, you simply paste in the ASIN, select the correct marketplace and click “extract”. Initially, the search status will say “extracting” like in the picture above. To see the results, you need to refresh the page, either by pressing F5 on your keyboard, or clicking the “refresh” button to the right of the screen. After you’ve refreshed the page, the status should change to “Done” and you should see a link to the search results, where you can find some pretty comprehensive data on each keyword. First up, you have rank, which tells you where that product ranks on Amazon for each keyword. Next, you have an estimated search volume score, which tells you how many times that keyword has been searched for over the last month. You can also see how many products are currently ranking for that keyword. The next three columns give you an overview of the first page of Amazon search results, for each keyword. You can see the average price, average rating, and average number of reviews for products currently on page one. You then get an opportunity score, which is there to help you quickly identify low competition keywords. The higher the score in this column, the easier it would be to rank on the first page of search results for that term. If you’re looking for keywords to use in your PPC campaigns, then AMZDataStudio can give you some great data. Their tool monitors Amazon sponsored ads constantly, and collects data on bids and ad position changes. It then uses this data to generate bid suggestions for each match type (broad, phrase and exact) which you can see in the final three columns of the table. In terms of filtering the data, you have the option to download a CSV and apply your own, or search the results for specific terms. AMZDataStudio also has a keyword generation tool, which works in a similar way. The only real difference is that you enter your seed keyword, and not an ASIN, in the search box. Once again, you have to refresh the page to see the results. I found that the results took longer to generate than when I searched using an ASIN. When the results appear, you get all the same data that you got from doing a search with the Competitors’ Keywords Finder. 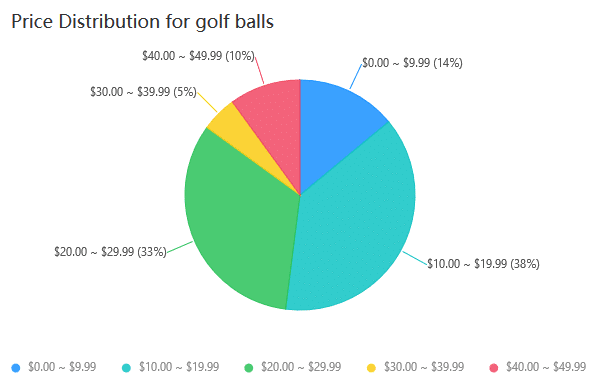 The only additional data you get is a pie chart showing the price distribution of products that rank for that keyword. The other nice addition that these results have, is a set of filters. This means that you can cut through the 200 plus results and get to the keywords that have the most potential quicker. The two primary filters you probably want to be using, are those for search volume and opportunity score. It’s worth mentioning that AMZDataStudio also have a tool, called “Search Term Extractor”, that can extract your competitor’s back-end keywords. But, because it doesn’t include any data about them, we haven’t covered it in detail in this article. AMZDataStudio has two different pricing methods. The first, is a monthly subscription, with the Starter Plan being the cheapest, at $97 per month. Under this plan you get 150 uses of the Keywords Generator, and 30 uses of the Competitors’ Keywords Finder. There are also two other paid plans, which offer you more uses of each tool. The second option is to buy credits on a pay-as-you-go basis. If you use this method, one use of the Keywords Generator costs you 10 credits and one use of the Competitors’ Keywords Finder costs you 15 credits. The final Amazon keyword tool that we are going to look at is DataHawk, which offers multiple functions including a keyword research tool, a product tracker and a market analysis tool. In this article, we are going to focus on the keyword research tool, which can help sellers to formulate short-tail and long-tail keywords. To get started, you need to click on “create a project”, you’ll then be asked to name it, choose which Amazon marketplace you want data on and you can also add a description. When you’ve done this, navigate your way to the keyword page and click on the “add new words to track” button. In the text box, enter your seed keywords, and add them to the tracker. Now, it’s time to generate some keyword suggestions. Choose the seed keyword that you wish to generate more terms from, and click on it. You’ll be taken to a page displaying the Amazon search results for that term. We’re going to ignore this for now, and click on the “Keyword Generator” button. DataHawk’s algorithm analyses related words, and the terms used by products that rank highly for your seed keyword, to produce keyword suggestions. These suggestions are broken down into two sections. The first, which it calls suggested keywords, shows long-tail phrases, including your seed keyword. 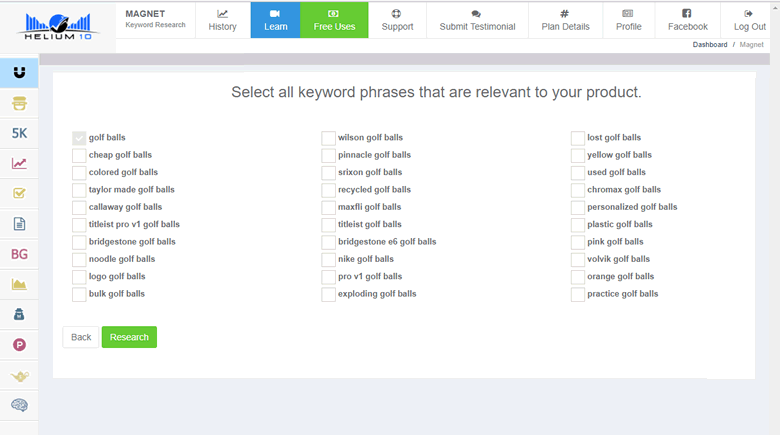 In the example below, my seed keyword was “golf balls” and the suggestions included “golf balls yellow” and “golf balls nike”. If any of the keyword suggestions match your product, you can click “track it”, to add the term to the tracker and get more data on it. The second section, gives you a list of single phrases which you can combine to make search terms. This option gives you complete control, as you can add as many terms as you want and re-order them to form keywords. You can then add them to the keyword tracker. Whether you’ve chosen to track the suggested keywords, made your own, or done a bit of both, you now need to go back to the keyword tracker, to get data on them. This data will show you a competition score for each keyword and the number of products that rank for that keyword in Amazon’s browsable search results. DataHawk then calculates the median price, rating and number of reviews that these results have. Often though, you have to wait for Datahawk to generate the search volume data for each keyword, which can take a few days. Using the keyword generator and tracker this way is useful for sellers who have their product but aren’t sure about their listing text. The suggestions and data can help sellers workout what to target, what not to target, and may even give them ideas for future products. It’s not the only way to generate keywords in DataHawk though, as you can also generate keyword suggestions based on products that already rank for your seed keyword. To do this, you need to go to the keywords tab and click on one of the terms that you are tracking. From here, you’ll be taken to the results page, that shows products already ranking for this keyword. When you see a product that is similar, or the same, as yours, click “Track It”. Now on the left hand side of the screen, click on the products icon. When you get to the tracked products page, choose the product that you want to generate keyword suggestions from. You’ll then be taken to a page with data about that product, ignore this for now and click on the keyword generator tab. This time, you get keyword suggestions, and have the option to build your own terms, based on phrases that the algorithm has deemed relevant to that product, in my case, Callaway 2017 Supersoft Golf Balls. In terms of pricing, DataHawk’s plans range from free forever, to $79 per month. The difference between plans is the amount of keywords and product ASINs you can track each month. The biggest difference between the free plan and the paid ones, is that you get monthly sales estimates when you track products. There is no practical substitute for using a tool for your keyword research. The number of keyword suggestions they generate, and the data they produce is just too difficult to reproduce without software. If you’ve never used an Amazon keyword tool before, then it’s worth looking at one of AMZDataStudio’s example searches, or signing up to a free forever plan with DataHawk. On the flipside, if you’re a big seller, and want to run a large volume of keyword searches, then Scope would be a good choice. It doesn’t appear to have limits on the number of searches you can do, just limits on the number of keywords or products you can track. 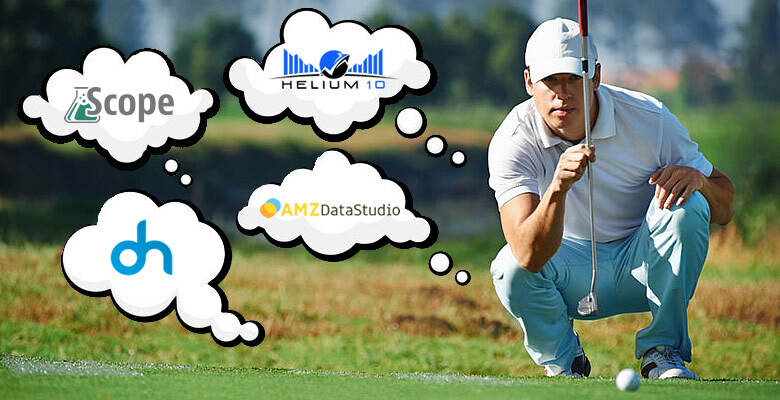 AMZDataStudio may also be worth considering for larger sellers. Their Business Plan offers 1350 keyword searches per month, but that does have a monthly cost of $395. That’s for a whole suite of tools though, not just the keyword generator. What are my favorite features in each tool? For Scope, I would have to say the nifty Chrome Extension and the keyword extraction power that it has. On Helium 10, I think that Magnet is a strong tool, but for me, Cerebro’s CPR scores are a real highlight, and an area of fascination. AMZDataStudio is a solid tool, and I’m torn between their very useful opportunity score, and their CPC breakdown. Finally, I really like DataHawk’s competition score, and the handy quotes not only give keyword research some character, but provide a great guide on which terms to target.